This is so true (and great picture!). 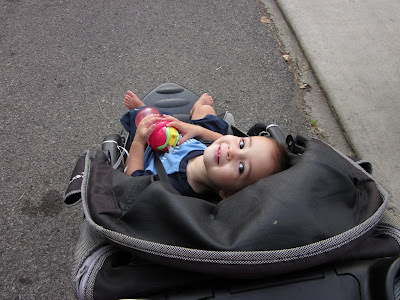 We have been traveling with our kids since before they could walk. Now they are 3 and 6 and it is amazing to me the things that my 6 year old does remember about our trips! I agree with you. I also believe that travel introduces new experiences that help develop a more well rounded child. Keep traveling! As an educator, it is amazing to see the differences in how children read in relation to their worldly experiences. Every new adventure or opportunity to leave the house, for that matter, exposes them to new situations, vocabulary words, appropriate social responses, etc., which allows them to better make connections from the text to their own lives-whether fiction or nonfiction. More parents need to make the time to see this value. Thank you for promoting the idea! I totally agree! Plus that adds to a kid's experiences and becomes a part of them. My girl (two years old) is SO much more comfortable traveling, seeing new people and places, going to restaurants, and having new experiences because she always has. She doesn't remember all the trips or things she has seen in her short life, but the experiences stay with her and make the next one not scary. I have friends and family who have not done this, then go on a trip and expect their kids to be so excited and instead their kids are scared. I agree! Our daughter was 15 months when we took her to Italy. She doesn't remember the trip, but she loves looking at the pictures and hearing the stories.